In this patient with hoarseness, opposing nodules are clearly seen at the anterior one third of the true vocal cords. These responded nicely to outpatient nonsurgical treatment (voice therapy). Video courtesy of Vijay R Ramakrishnan, MD. Confronted with symptoms of dysphonia, the clinician is charged with accurate diagnosis and timely institution of appropriate therapeutic intervention. Vocal fold lesions are a common cause of hoarseness. A more thorough understanding of these benign lesions has been the goal of laryngologists and voice scientists over the last several decades, since Hirano's description of the complex layered microanatomy of the human vocal fold. Several distinct pathologic entities are encompassed in this broad category, including laryngeal papillomatosis, intracordal cysts, sulcus vocalis, and vascular ectasia, as well as vocal fold nodules (VFNs) and vocal fold polyps (VFPs). Each of these entities has an attendant clinical presentation; each presents diagnostic and treatment challenges. This article focuses specifically on vocal fold nodules (VFNs) and vocal fold polyps (VFPs). A thorough history of all patients presenting with a voice symptom is essential. A complete medical history must include a chief problem and history of present illness, which requires the patient to articulate the exact quality, timing, frequency, and task-specific nature and exacerbating or ameliorating factors of their voice problems. A review of past medical and social history and present medications is necessary to identify potential contributing factors, such as thyroid disease, smoking history, caffeine use, and/or use of prescription or over-the-counter (OTC) medications. A unique portion of the vocal history is the careful attention paid to patterns of vocal behavior (including occupational use and recreational and social behaviors) that may provide clues to contributory vocal overuse, vocal misuse, and vocal abuse (ie, phonotrauma), as well as the state of vocal hygiene. Careful attention to voice-use history in immediate proximity to the onset of the symptom can offer clues to the nature of the problem. In the case of singers, understanding the patient's singing history and level of vocal training (as well as performance style and setting) is essential in formulating an accurate differential diagnosis. A characteristic history of present illness referable to either vocal fold polyps (VFPs) or vocal fold nodules (VFNs) may include subjective symptoms of breathy, weak, raspy, or hoarse voice quality. The patient may also report a change in the baseline vocal pitch with limited vocal range. Patients may report increased effort and fatigue associated with voice production. Singers commonly note decreased voice quality and singing endurance, loss of upper registers, and difficulty with precise vocal control. 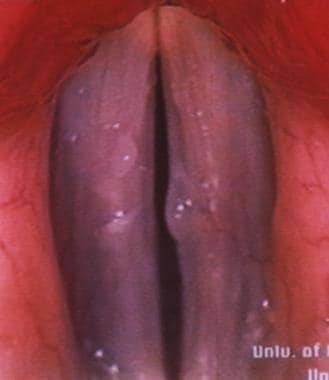 Vocal fold polyps (VFPs) are generally unilateral and have a broad spectrum of appearances, from hemorrhagic to edematous, pedunculated to sessile, and gelatinous to hyalinized. Vocal fold polyps (VFPs) are believed to result from phonotrauma; however, they are also recognized to potentially arise from a single episode of hemorrhage. In 1995, Dikkers et al found that the combination of signs of recent bleeding and depositions of fibrin and iron pigment in macrophages resided almost exclusively in polyps when compared with other benign lesions. Moreover, approximately a third of the vocal polyps in their sample showed evidence of capillary proliferation, further lending credence to the theory of bleeds as the inciting event. The video below depicts a pedunculated hemorrhagic polyp along the anterior right true vocal fold. Along the anterior right true vocal fold, a pedunculated hemorrhagic polyp is seen. Surgical treatment is indicated. Video courtesy of Vijay R Ramakrishnan, MD. Vocal fold polyps (VFPs) typically involve the free edge of the vocal fold mucosa, although they may also be found along the superior or inferior borders. Occasionally, a more diffuse pattern termed polypoid degeneration is observed as well. This pattern is referred to as Reinke edema and is generally considered a separate pathologic entity. For the purposes of this article, comments are limited to isolated focal lesions of the true vocal fold (TVF). Both nodules and polyps may interrupt the vibratory patterns of the vocal fold by increasing the mass and reducing the pliability of the overlying cover (ie, cover/body theory of vocal fold vibration), as well as by impeding proper closure of the membranous folds throughout the glottic cycle. Nonneoplastic lesions of the vocal folds are presumed to represent a response to vocal trauma (more specifically, phonotrauma in the case of vocal fold polyps and vocal fold nodules). A 1999 survey performed by Hogikyan et al elicited opinions of the professional groups most involved with the care of the voice (including laryngologists, speech language pathologists, and singing teachers) to gauge the prevalence of opinions regarding the specific entity of VFNs. The survey found that the prevailing and nearly unanimous belief follows: "Practices that constitute either abuse or misuse of the speaking and/or singing voice were felt by all groups to be of greatest importance in causing vocal fold nodules in singers." For the sake of clarity, vocal abuse refers to vocal behaviors that are practiced under circumstances that lead to trauma of the laryngeal mucosa. Excessive talking, prolonged and excessive loudness, use of inappropriate pitch, excessive cough, and throat clearing are some of these vocally abusive behaviors. Vocal misuse involves abnormal vocal behaviors that cause stress or trauma to the larynx. Such practices include the use of excessive tension and effort while phonating, hard glottal attacks, and ventricular phonation. The concept of vocal overuse is self-explanatory. In the effort to substantiate these traditional clinical beliefs regarding the etiology of vocal lesions, in 1987 Gray et al undertook the task of creating an animal model in which to study the pathologic process. In an experiment designed to simulate phonotrauma, canines were hyperphonated artificially for periods of 2, 4, and 6 hours, after which the ultrastructure of their vocal fold was examined under electron microscopy to determine early anatomic changes related to phonotrauma. With 2 hours of persistent phonation, Gray et al demonstrated reproducible structural changes that were absent in the control animals. The inherent shortcoming of such studies lies in the inability to perform longitudinal follow-up of the pathologic changes due to phonotrauma and, more importantly, the uncertainties of extrapolating data to humans (ie, given the behavioral differences between the canines in Gray's study protocol and normal human vocal behaviors as well as differences in vocal fold microanatomy). In 2000, Andrade tested these causal behavioral assumptions by designing a retrospective study that attempted to correlate the frequency of specific, observed, vocally traumatic behavior (ie, hard glottal attack) with the type and extent of clinically visible vocal pathology. The investigators hypothesized that a higher frequency of hard glottal attack would be found in patients exhibiting muscle tension dysphonia (MTD) and/or vocal fold lesions than would be found in normal speakers. Further, investigators hypothesized that the frequency of these behaviors would correlate positively with the presence and severity (unilateral versus bilateral) of the observed vocal fold pathology. Results of Andrade's study confirmed a higher frequency of hard glottal attack in the disordered groups than in the controls. On the other hand, the study did not demonstrate a difference in frequency between the purely MTD group and those with lesions or between the unilateral and bilateral lesion groups. The literature notes other clinical associations with VFNs. Some authors have mentioned an anecdotal association between the presence of anterior glottic microwebs and nodules. Additionally, the contributory role of gastroesophagopharyngeal reflux in the pathogenesis of VFN has been studied. In 1998, Kuhn et al compared a small cohort of patients with VFN against volunteers with normal health. Both groups were studied with barium esophagraphy and ambulatory, 24-hour, 3-site pharyngoesophageal pH monitoring. Kuhn found that the prevalence of pharyngeal reflux events was significantly higher in patients with VFN compared with normal controls. Vibration-induced elevations in capillary pressure have also been hypothesized to cause vocal nodules and associated edema. These results supports voice therapy aimed at reducing vibratory amplitude. As previously mentioned, the clinical presentation of benign vocal fold lesions is most commonly associated with a voice change. Typical presenting symptoms include generalized and persistent hoarseness, change in voice quality, and increased effort in producing the voice. The laryngeal examination may show either unilateral or bilateral lesions of the TVF. Because it has the ability to demonstrate subtle differences in the appearance, pliability, and mucosal wave characteristics (ie, symmetry, periodicity, amplitude, vertical phase difference) of the TVF cover, videostrobolaryngoscopy is far more sensitive for detecting and differentiating laryngeal lesions when compared with other indirect laryngoscopy techniques. Diagnostically, nodules do not tend to significantly disturb propagation of the mucosal wave on stroboscopy, but they may contribute to incomplete closure during the glottic cycle, depending upon their size. Polyps have various appearances but generally are unilateral and much more likely to interfere with proper closure of the glottis during phonation and to cause a more noticeable change in the quality of the speaking/singing voice. The potential location of polyps on the superior and infraglottic (as well as the medial) surface of the cord makes the ability to separately visualize both upper and lower vertical lips of the cord on videostroboscopic examination all the more important to their detection. Vocal fold polyp (VFP) found during office videostroboscopy. Indications for surgical intervention in benign TVF mucosal lesions are relative. Even in the most casual of voice users, the proposition of surgical intervention should never be taken lightly, especially given the ever-present potential for poor healing or irreversible scarring, which causes permanent change in the speaking/singing voice. In general, vocal fold microsurgery is considered for cases in which the patient remains unacceptably vocally impaired despite compliance with a medical treatment and voice therapy regimen. Rare instances may also occur, in which the lesion (typically, a large polyp) threatens the patency of the airway. In these cases, the polyp's vocal impact is a distant secondary consideration. In other specific instances (eg, extremely long history of voice limitations, mucosal injury clearly resulting from a one-time event, clearly irreversible pathology), surgery may appropriately be considered at initial diagnosis. Even in this setting, however, the patient may benefit from one or more voice therapy sessions or from optimal preoperative education and postoperative compliance with the rehabilitative regimen. The importance of careful patient selection cannot be overstated. At a minimum, rudimentary vocal education and a commitment to compliance with a preoperative and postoperative vocal regimen is required of any surgical candidate. This regimen routinely includes limitation of vocally damaging behavior and observance of improved vocal hygiene with respect to alcohol, caffeine, tobacco, and hydration. The patient must be committed to the recommended courses of both preoperative and postoperative voice therapy (and singing instruction as appropriate) and to the prescribed course of perioperative vocal rest that allows for optimal surgical healing and results. In the most general of terms, patients who do not meet these criteria are poor operative candidates; therefore, surgery is relatively contraindicated. Advances in modern phonomicrosurgical techniques have largely stemmed from improved understanding of the complex microarchitecture of the TVF as described by Hirano. More specifically, understanding of the role of the layered architecture to normal voice production has led to surgical techniques designed for maximal preservation of the normal structure. The TVF is composed of 5 individually identifiable layers. The deepest layer consists of the thyroarytenoid muscle body. This muscle is capable of contraction and serves to voluntarily stiffen and thicken the vibratory margin of the cord. Overlying the muscle is a region referred to as the lamina propria (LP), which can be divided into 3 portions (ie, superficial, middle, deep) based on the molecular compositions of each. The deep layer of the LP is largely comprised of densely crowded collagen fibers. The middle layer has some collagen but is distinguished by its high elastin content. The deep and middle layers of the LP blend imperceptibly on operative dissection to form a structure commonly referred to as the vocal ligament, a recognized and important landmark in vocal fold surgery, as well as a transition zone between the body (muscle) and the cover (epithelium and superficial LP) of the TVF. The superficial LP is composed of mostly amorphous ground substance and a few fibrils. The importance of this layer (which is not well appreciated on traditional hematoxylin and eosin [H&E] staining) to normal vibratory behavior of the TVF has been progressively elucidated over the last 30 years. The most superficial of the layers is the stratified squamous epithelial cover that overlies the LP. The patient must be committed to the recommended courses of both preoperative and postoperative voice therapy (and singing instruction as appropriate) and to the prescribed course of perioperative vocal rest that allows for optimal surgical healing and results. In the most general of terms, patients who do not meet these criteria are poor operative candidates; therefore, surgery would be relatively contraindicated. El Uali Abeida M, Fernández Liesa R, Vallés Varela H, García Campayo J, Rueda Gormedino P, Ortiz García A. Study of the Influence of Psychological Factors in the Etiology of Vocal Nodules in Women. J Voice. 2011 Nov 14. [Medline]. Yamasaki R, Behlau M, Brasil Ode O, Yamashita H. MRI anatomical and morphological differences in the vocal tract between dysphonic and normal adult women. J Voice. 2011 Nov. 25(6):743-50. [Medline]. Dikkers FG, Nikkels PG. Benign lesions of the vocal folds: histopathology and phonotrauma. Ann Otol Rhinol Laryngol. 1995 Sep. 104(9 Pt 1):698-703. [Medline]. Hogikyan ND, Appel S, Guinn LW, et al. Vocal fold nodules in adult singers: regional opinions about etiologic factors, career impact, and treatment. A survey of otolaryngologists, speech pathologists, and teachers of singing. J Voice. 1999 Mar. 13(1):128-42. [Medline]. Gray SD, Titze I, Lusk RP. Electron microscopy of hyperphonated canine vocal cords. J Voice. 1987. 1(1):109-115. Andrade DF, Heuer R, Hockstein NE, et al. The frequency of hard glottal attacks in patients with muscle tension dysphonia, unilateral benign masses and bilateral benign masses. J Voice. 2000 Jun. 14(2):240-6. [Medline]. Shah RK, Woodnorth GH, Glynn A, et al. Pediatric vocal nodules: correlation with perceptual voice analysis. Int J Pediatr Otorhinolaryngol. 2005 Jul. 69(7):903-9. [Medline]. Roy N, Holt KI, Redmond S, et al. Behavioral characteristics of children with vocal fold nodules. J Voice. 2007 Mar. 21(2):157-68. [Medline]. Kuhn J, Toohill RJ, Ulualp SO, et al. Pharyngeal acid reflux events in patients with vocal cord nodules. Laryngoscope. 1998 Aug. 108(8 Pt 1):1146-9. [Medline]. Czerwonka L, Jiang JJ, Tao C. Vocal nodules and edema may be due to vibration-induced rises in capillary pressure. Laryngoscope. 2008 Apr. 118(4):748-52. [Medline]. Cho KJ, Nam IC, Hwang YS, Shim MR, Park JO, Cho JH, et al. Analysis of factors influencing voice quality and therapeutic approaches in vocal polyp patients. Eur Arch Otorhinolaryngol. 2011 Sep. 268(9):1321-7. [Medline]. Gomaa MA, Hammad MS, Mamdoh H, Osman N, Eissawy MG. Value of high resolution ultrasonography in assessment of laryngeal lesions. Otolaryngol Pol. 2013 Sep-Oct. 67(5):252-6. [Medline]. Gray SD, Hammond E, Hanson DF. Benign pathologic responses of the larynx. Ann Otol Rhinol Laryngol. 1995 Jan. 104(1):13-8. [Medline]. Effat KG, Milad M. A comparative histopathological study of vocal fold polyps in smokers versus non-smokers. J Laryngol Otol. 2015 May. 129 (5):484-8. [Medline]. Nakagawa H, Miyamoto M, Kusuyama T, Mori Y, Fukuda H. Resolution of Vocal Fold Polyps With Conservative Treatment. J Voice. 2011 Nov 12. [Medline]. Wang CT, Liao LJ, Lai MS, Cheng PW. Comparison of benign lesion regression following vocal fold steroid injection and vocal hygiene education. Laryngoscope. 2013 Jul 30. [Medline]. Wang CT, Lai MS, Cheng PW. Long-term Surveillance Following Intralesional Steroid Injection for Benign Vocal Fold Lesions. JAMA Otolaryngol Head Neck Surg. 2017 Jun 1. 143 (6):589-94. [Medline]. Jensen JB, Rasmussen N. Phonosurgery of vocal fold polyps, cysts and nodules is beneficial. Dan Med J. 2013 Feb. 60(2):A4577. [Medline]. Benninger MS. Microdissection or microspot CO2 laser for limited vocal fold benign lesions: a prospective randomized trial. Laryngoscope. 2000 Feb. 110(2 Pt 2 Suppl 92):1-17. [Medline]. Remacle M, Lawson G, Watelet JB. Carbon dioxide laser microsurgery of benign vocal fold lesions: indications, techniques, and results in 251 patients. Ann Otol Rhinol Laryngol. 1999 Feb. 108(2):156-64. [Medline]. Mizuta M, Hiwatashi N, Kobayashi T, Kaneko M, Tateya I, Hirano S. Comparison of vocal outcomes after angiolytic laser surgery and microflap surgery for vocal polyps. Auris Nasus Larynx. 2015 Dec. 42 (6):453-7. [Medline]. Ragab SM, Elsheikh MN, Saafan ME, et al. Radiophonosurgery of benign superficial vocal fold lesions. J Laryngol Otol. 2005 Dec. 119(12):961-6. [Medline]. Bastian RW. Vocal fold microsurgery in singers. J Voice. 1996 Dec. 10(4):389-404. [Medline]. Courey MS, Gardner GM, Stone RE, et al. Endoscopic vocal fold microflap: a three-year experience. Ann Otol Rhinol Laryngol. 1995 Apr. 104(4 Pt 1):267-73. [Medline]. Courey MS, Shohet JA, Scott MA, et al. Immunohistochemical characterization of benign laryngeal lesions. Ann Otol Rhinol Laryngol. 1996 Jul. 105(7):525-31. [Medline]. Dikkers FG, Nikkels PG. Lamina propria of the mucosa of benign lesions of the vocal folds. Laryngoscope. 1999 Oct. 109(10):1684-9. [Medline]. Hochman II, Zeitels SM. Phonomicrosurgical management of vocal fold polyps: the subepithelial microflap resection technique. J Voice. 2000 Mar. 14(1):112-8. [Medline]. Kleinsasser O. Pathogenesis of vocal cord polyps. Ann Otol Rhinol Laryngol. 1982 Jul-Aug. 91(4 Pt 1):378-81. [Medline]. Kotby MN, Nassar AM, Seif EI, et al. Ultrastructural features of vocal fold nodules and polyps. Acta Otolaryngol. 1988 May-Jun. 105(5-6):477-82. [Medline]. This picture shows the surgical view of a vocal fold polyp (VFP) as observed via high-power microlaryngoscopy. This picture is a postoperative surgical view immediately following microsurgical removal of vocal fold polyp (VFP). Videostroboscopy of postoperative vocal fold polyp (VFP). This is an image from office examination of the same patient as in Image 3, 6 days following VFP removal. Note the straight edge of the vocal fold (right side of image).